Hello again! I am very excited to be back this week. I have another super cute card to share! 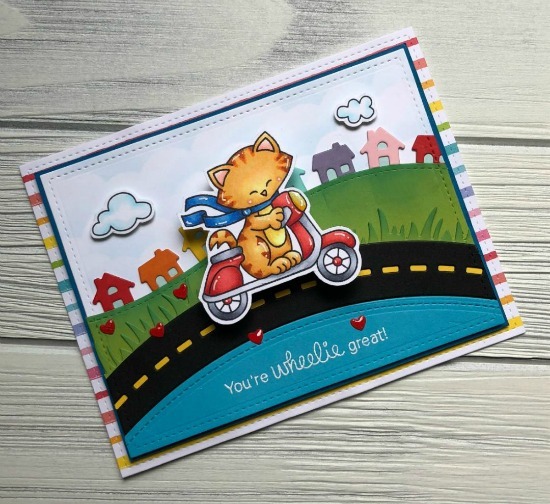 For this card, I used the Newton Scoots By Stamp Set. I created a scene card using different dies including one that makes a roadway for Newton to putter along on. I blended a little Lucky Clover Distress Oxide Ink onto the grass pieces and layered cardstock to add depth to the scene. I decided to use a rainbow color scheme to add a happy and bright feel to the card. I stamped the images onto smooth white cardstock, used Copic markers to color them in, and then fussy cut them out. 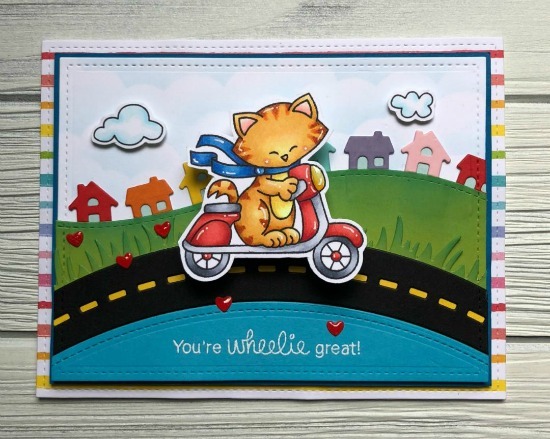 To add a fun element to the card design, I popped Newton and his scooter up on an action wobble. You can check out a video showing the wobble in action on my Instagram account. This card is adorable ! I love the houses having various colors.